DIY Fascinator Making With Glam Hatter Girl, Janie. Perfect for a rainy Sunday afternoon and it should take you 30 minutes. Janie Designed this workshop for The National Gallery and The Glam Hatter Girls ran it on Friday the 16th December 2016. 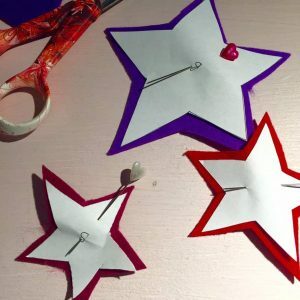 If you didn’t get a chance to go to our workshop at The National Gallery you can make it at home instead! Perfect for a rainy Sunday afternoon and it should take you 30 minutes. (Unless like me you get carried away with the beading!!!) You will need scissors, felt squares (Cass Art), paper, pins, needle, thread, beads and sequins (John Lewis), a head band (Creative Beadcraft). How To Make A Star Fascinator, Step 1. 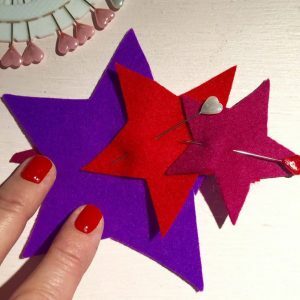 First of all cut out 3 paper stars in small, medium and large (hold them up to your head to see what size you would like). Pin them to you felt squares. How To Make A Star Fascinator, Step 2. Secondly cut around your paper templates. You should leave a little gap between the paper and the felt. This stops the scissors getting blunt! How To Make A Star Fascinator, Step 3. 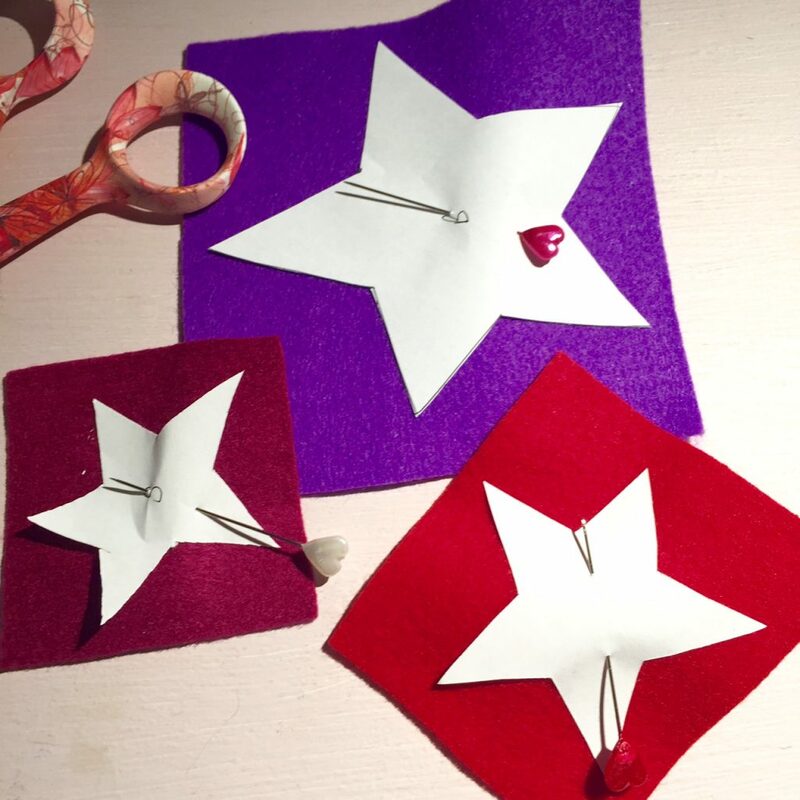 Then pin the 3 stars together (alongside each other). If you graduate the sizes it gives a pretty vintage look. At this point think about how you will be wearing your hair and then arrange the stars to compliment your hair style. 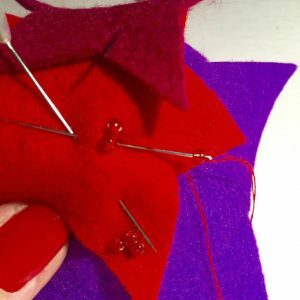 How To Make A Star Fascinator, Step 4. You should choose your beads in the same colour as your thread because that way the thread won’t show up on the side of the beads. If you go for small beads you can spend a lot of time doing gorgeous intricate designs. Larger beads are great for a statement piece. Step 5. 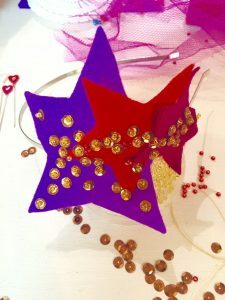 How To Make A Star Fascinator. Step 6. 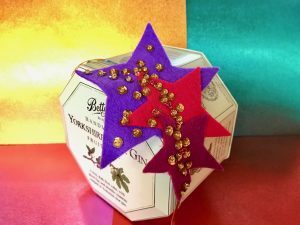 How To Make A Star Fascinator. Once you’ve sewn the stars together pin the piece to your headband. Then attach to the headband by sewing through the felt and around the band underneath. Step 7. 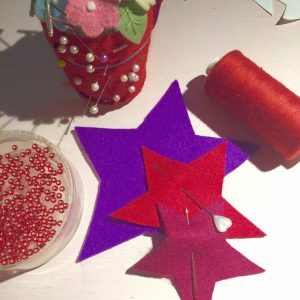 How To Make A Star Fascinator. Choose sequins and beads that will give your headband a shimmer. At this time of year I like to use gold on everything!!! Step 8. 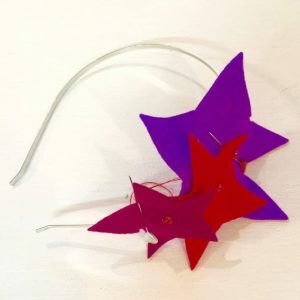 How To Make A Star Fascinator. 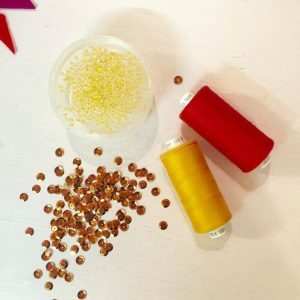 Finally sew your beads and sequins to your stars. I’ve sewn quite a lot to this because with a flat to the head fascinator you can get away with a lot of beading. 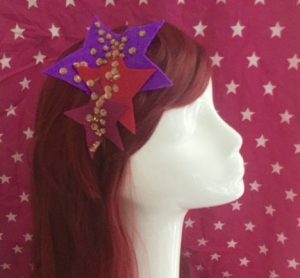 This also gives a lovely vintage inspired feel to the star headdress furthermore you can wear it with lots of different coloured outfits! If you’d like to book in for a workshop with Glam Hatters we have lots of hen party workshops including, vintage fascinator making, flower crowns, 1920’s Headdress and our brand new mask making workshop click here. We also run individual workshops – check out Facebook page for those as we add new ones all the time! I’d love to see the star fascinators that you make. Please add your pictures to the comment boxes below or add to my Face book page below! Happy sewing and creating.